Guard houses are an important part of any business property. They give you the ability to observe those working, and can even provide a screening point for people to enter. Having a modular guard house allows your booth to adapt to new changes in layout and even move to a new project site should the need arise. This gives your company an incredible return on investment, rather than simply expanding the project site or adding a permanent building. One of the biggest benefits of a prefabricated guard house is the flexibility. When you work with a company like Panel Built, your final product is always lightweight and easy to move. Like all modular buildings, prefabricated guard houses can also be added on to. For example, if your company expands, you can easily add a small break room or bathroom to your guard house to keep your employees more comfortable. This flexibility allows you to cheaply expand without reducing the quality of your buildings. The guard houses are also flexible in terms of design. Working with an experienced company will allow you to pick and choose from standard designs or create your own. One of the most popular designs is a simple structure done in neutral colors, like tan or white, so that the building blends into the property’s scenery. More unique structures and colors are available, making it easy to match the guard building to your logo or main buildings. Anything is possible with a prefabricated guard house, making them a professional addition to your worksite. Security is one of the most important parts of running a business. If you are working on a restricted access site or have a project not ready for the public’s eye, you need a way to control the amount of people on your site. Prefabricated security guard houses allow you to usher in guests and employees so that a security guard knows they are on site and why they are there. This also helps your company build a record of everyone who entered the site. Portable guard houses are built to be very strong. Even if you choose not to have 24 hour security staff in the booth, you can use it to store electronics used to monitor the site. This location is a great place to store supplies and other things necessary to your business. With the flexible layout, you can add walk-in closet space or other storage if you choose. Because prefabricated guard houses are such a necessity, many companies are available to produce them. 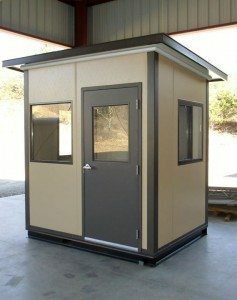 When you first start to look for the best guard booth available online, you should start with an experienced company like Panel Built. Panel Built is a security booth company that works online to help cut costs as often as possible without reducing quality. They build the prefabricated security guard houses on their property and then deliver them anywhere in the United States. Even though they offer lower prices and custom built designs, they still work as quickly as possible to fulfill orders. This helps companies get the security booths they need as fast as possible and reduce downtime. Guard booths are highly customizable and therefore the price will vary based on your needs. Large guard booths with multiple rooms or canopies will have a much higher price tag than a traditional building with only a small spot for a single guard to sit or stand. The variety is a great benefit, because you only pay for the space you need. Building the portable guard house extra-strong can also add to the price. There are a variety of durable materials available to build the security booth. Each one is chosen for its resistance to rust and corrosion, as well as its ability to stand up to adverse weather conditions. Reinforcing the guard booths with a material that is built to last is common, but may add to the price. 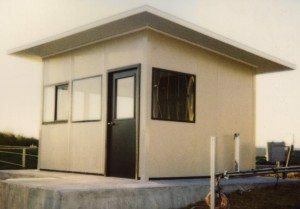 There are several benefits of prefabricated security guard houses. Working with a professional company like Panel Built will help you find ways to take advantage of all these benefits and get the most out of your investment.